On Wednesday, January 31, 2018 at about 9:00pm, the American Center of Philippine Arts (ACPA) musicians were rehearsing for our upcoming show, ANIHAN: The Harvest in partnership with Kariktan Dance Company (scheduled for February 17, 2018). 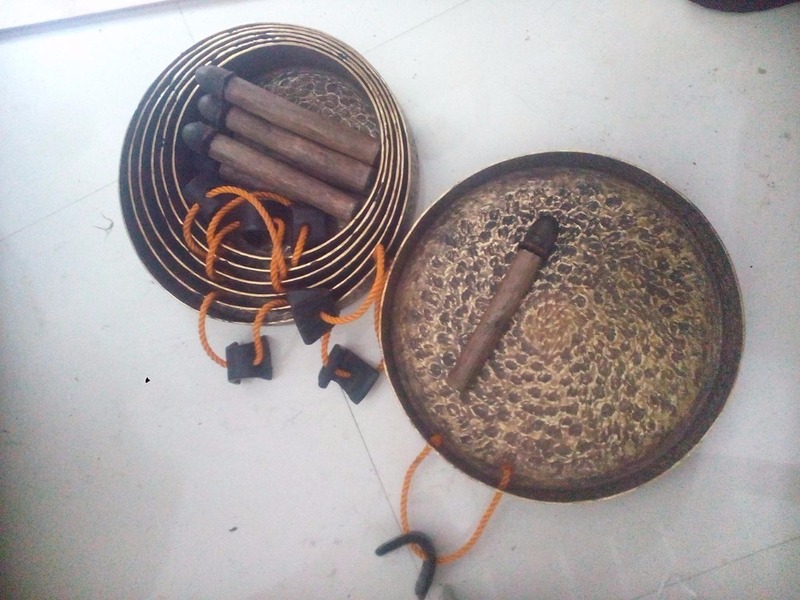 During the rehearsal, thieves broke in to one of our partner musician's cars and grabbed a bag in the backseat that had our Gangsa set (7 brass gongs from Kalinga, Philippines). Despite our attempts to see if the theives might have abandoned the bag or tried selling it to a local metal scrap yard, we've been unsuccessful in retrieving our instruments back. We are all extremely heartbroken over the loss, especially just 2 weeks before our show, but the outpouring of support that we have received in the last few days have been amazing. Community members and supporters have asked how they could help so that we can replace the instruments that were stolen, and so we have set up this GoFundMe page to help us raise the funds for a new Gangsa set. Funds we raise here will go towards a new set as well as any shipping/baggage overage costs from the Philippines to California. Donations allowed by law will be tax-deductive. ACPA would like to thank everyone for their ongoing support over the years and for listening to our story. 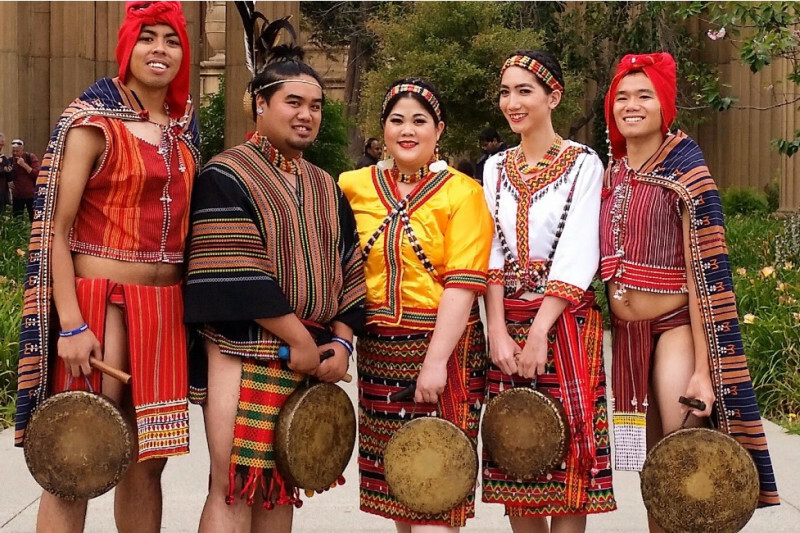 A donation of ANY amount, (even $1) helps our volunteer-based nonprofit continue to build the Filipino cultural arts community and strengthen our Filipino identity in the San Francisco Bay Area and beyond. Hi Everyone! I'm so very sorry for not sending an update sooner as life, work, the ACPA show, and preparing for Pilipino Cultural Nights (PCNs) for the colleges have taken over the last month! Although we were never able to retrieve our stolen gangsa set, we are so happy to announce that thanks to everyone's support, we were able to locate and purchase a new, beautiful set and it has been brought to us here to the San Francisco Bay Area! 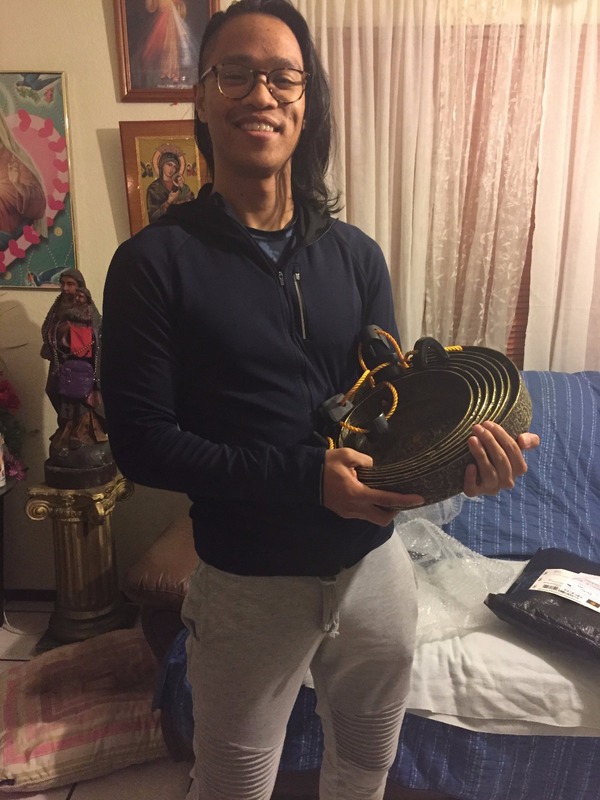 Pictured, you see Brian Batugo, performer with Parangal Dance Company and Arts Director for the Little Manila Dance Collective in Stockton, who was kind enough to connect with our contact in the homeland and bring 60lbs of brass back to California with him! We also pictured the photo we received from Robert Lopez from Pinas, who worked to get us a set as soon as possible. Because we were able to raise money above and beyond our goal, we were able to secure a 2nd set from Kalinga, thanks to Jenny Bawer Young, Major Julian, Eric Solano, Vanessa Brake, and the rest of the Parangal Dance Company Pamilya! You helped us increase our capacity and we can now give more music education to both youth and adults! On behalf of American Center of Philippine Arts and our musicians, we can't thank you all enough for your generous support of our work! We look forward to seeing you at one of our upcoming gigs. ACPA musicians are keeping busy instructing students of USF's Kasamahan, UC Davis' Mga Kapatid, and SFSU's PACE for their upcoming shows! Our rondalla will also be accompanying the Little Manila Dance Collective's youth for their show on June 9th in Stockton, and on top of that, we will be starting our ACPA SEED Youth program again at the end of April. Brian Batugo brings our new set home! The photo we received from Pinas! Thank you to everyone for continuing to donate to this page and for sharing our story with others! We hope to see you at our upcoming ACPA & Kariktan Dance Company show - ANIHAN: The Harvest on February 17. Tickets are still on sale at eventbrite.anihanshow.com. Mga Pamilya! You love us, you really do love us! Our hearts are overwhelmed with all the generosity ACPA musicians have received after just 1 day of opening this campaign. We have officially reached our goal to replace our stolen gangsa! WHOOHOO!! Thank you all so much. We will continue to keep the page open and any monies raised above our goal will allow us to purchase new instruments so we can teach more students Philippines-inspired music! Maraming maraming salamat sa iyong suporta! !